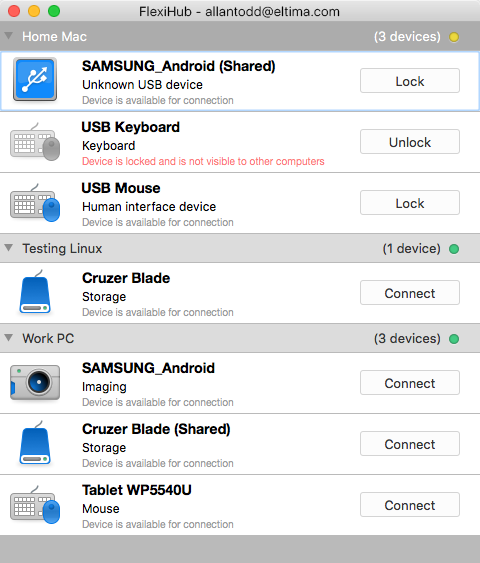 FlexiHub is a versatile software tool to access the contents and functionality of remote USB devices over network. With FlexiHub you can access and manage remote devices as if they were connected directly to your machine no matter where they are actually physically located - next door or across the globe. The app forms a hardware cloud that has all devices connected to network computers via USB ports. The devices are listed along with their types so you can easily figure out what device you need to connect to - a scanner, a printer, a USB dongle, a camera, etc. FlexiHub users can also invite others to access and work with their shared devices. You can access a device share on a Mac from Windows machine and the other way round. The app is especially helpful in corporate environment where it is often required to share data - in a fast, efficient and secure way. The safety of your data is guaranteed by secure 256-bit SSL encryption, you do not need to worry about your sensitive data being accessed by an unauthorized party. By compressing data, FlexiHub in effect reduces data traffic. This powerful application is also very easy-to-use, all you have to do is to download and install FlexiHub: a server part on a computer whose USB ports are to be shared, and a client part on computers that need access to the shared ports. Once you share a USB device, it becomes accessible to all authorized users in the network. FlexiHub can be integrated into other software solutions, please try our API evaluation program and test FlexiHub integration. Statement: First, please download the orginal installation package by clicking the download link. Of course you may also download it from the publisher's website. Using FlexiHub for Mac crack, key, patch, serial number, registration code, keygen is illegal. The download file hosted at publisher website. We do not provide any download link points to Rapidshare, Hotfile, Depositfiles, Mediafire, Filefactory, etc. or obtained from file sharing programs such as Limewire, Kazaa, Imesh, Ares, BearShare, BitTorrent, WinMX etc. Software piracy is theft. If you like FlexiHub for Mac please buy it.